First-time volunteers: no need to call ahead, just come by at the start of a session. That’s when we offer a brief orientation. Once you’ve done that, you can stay for however long you’d like and come at any time during future sessions. It’s greatly appreciated when volunteers can bring heavier paper bags—these are great for packaging books. Trader Joe’s and Whole Foods have good bags for this purpose. PLEASE NOTE: We cannot accommodate service groups during our regular packing sessions. To arrange a special packing session for a group, please email us at info@booksthroughbarsnyc.org. Volunteering usually requires being on your feet downstairs, but there are some tasks that can be done stationary in the bookstore upstairs. Please contact us if you have any concerns about whether we can accommodate your needs at a volunteer session. 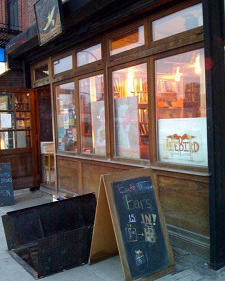 Freebird is located at 123 Columbia Street between Kane and Degraw, in Carroll Gardens/Cobble Hill, Brooklyn. From the Bergen F/G stop, or the Borough Hall 4 /5 stop, walk along Court Street to Kane, then down Kane to Columbia. Or take the B61 bus to Freebird’s front door – the B61 goes directly to and from the Jay St.-Metrotech stop (A, C, F, and R trains) and is a 10-15 min. ride (and a free transfer). The B61 stop is on Jay St. in front of Duane Reade. During our Monday and Wednesday packing sessions, Freebird is not open, so we use the basement hatch to enter Books Through Bars’ space. In the colder months, the basement hatch may be closed, although the bottomliner and other volunteers are inside. Unless clearly stated on our Facebook and Twitter that we are cancelled or the time has changed, we are operating. Please knock on the hatch to enter.